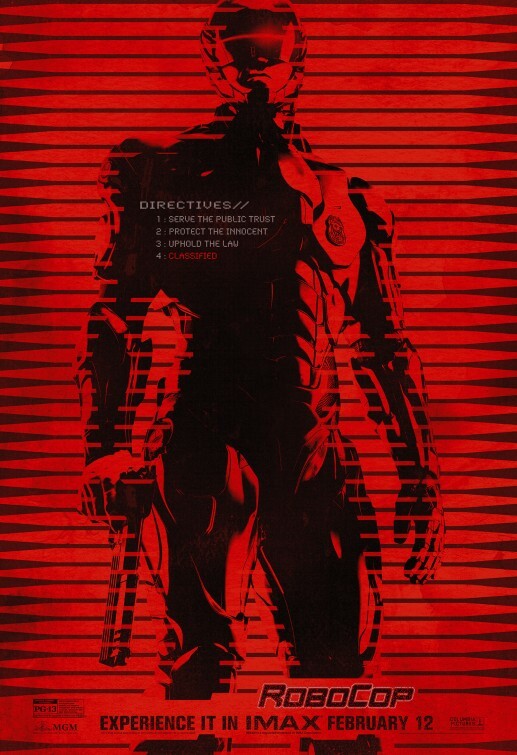 Synopsis: In 2028 Detroit, when Alex Murphy – a loving husband, father and good cop – is critically injured in the line of duty, the multinational conglomerate OmniCorp sees their chance for a part-man, part-robot police officer. Review: Even uglier than the recent trend of Hollywood eating its own by remaking many a film barely 30 years old is the nasty critical backlash lobbed at these remakes. While some of this ire is warranted (I’m looking at you 2012’s Total Recall) there seems to be efforts that become collateral damage, wrongly tossing commendable efforts like José Padilha’s update to RoboCop into the junkbin. Listen, Paul Verhoeven’s 1987 RoboCop is a not-minor classic but one that I wasn’t overly attached to, so treating it like a precious property isn’t going to allow anyone to really enjoy the 2014 remake. The thing that made the ’87 sci-fi action film so razor sharp was its cynicism toward violence and the media, a concept reaching its peak in the final years of the advent of the “me” generation. The digs taken at the alarming change in what was considered entertainment came at the right time and right place. That same approach wouldn’t have worked for this update; after all we live in a time when stardom can be achieved for doing nothing so Padilha and screenwriter Joshua Zetumer wisely jettison that impossible to match angle for something admittedly less special and memorable…but one that provides the kind of entertainment that is engaging, if altogether fleeting. The structure of this RoboCop is largely the same: in the not-too-distant future robotic technology has become more advanced and popular opinion is that it’s still too early to embrace the benefits of a robot protected society. The head of tech giant OmniCorp (Michael Keaton, Gung Ho!, a welcome presence) decides that the public needs to be shown the light and wonders what would happen if there was a beating heart in one of his robot warriors. That’s where Detroit cop Alex Murphy comes in. As played by Joel Kinnaman (The Girl with the Dragon Tattoo), he has that same blandness that worked for previous star Peter Weller…though Kinnaman has significantly more “face” time in this film allowing us to see the man inside the machine. Injured in the line of duty while investigating an arms dealer and police corruption, he’s saved by OminiCorp technology and becomes their RoboCop. I’m not sure if adding more heart to the film is what audiences expected or wanted but if the cynicism was lost in the reboot there had to be something to fill the gaps. This means Murphy’s wife (a non-presence in the first film) has more to do…even if Abbie Cornish winds up delivering most of her lines like she’s shivering in sub zero temperatures. Where the previous film introduced the refurbished Murphy as an emotionless drone that gradually remembers his humanity, the new Murphy wakes up with the memories of his past, only to see them next to erased by corporate bottom-lining that ordered a machine without scruples. Rounding out the quite well acted ensemble of performers are a kindly Dr. Frankenstein-like character played with dimension by Gary Oldman (Lawless) and a blowhard political reporter etched out by Samuel L. Jackson (Django Unchained) on a CGI-graphic heavy set that looks remarkably like the one Jackson shoots his credit card commercials on. Hints at the dark comedy of the original film come through Jackson’s character and he’s given enough free rein to be over the top while eschewing winking knowingness. Had the film cannibalized the original loyal fans would have gone crazy (and rightly so)…and I find it a bit unfair critics have knocked the film for not going that direction…maybe it was a lose-lose situation for all involved with updating this story. For me, I was able to keep the tonally different film from ’87 at enough of a distance and take this revamp for ’14 for what it is – handsomely rendered entertainment that’s serviceable at its worst and involving at its best.